Whizmarket Search is a browser hijacker, usually bundled with free software. Hijackers are not malicious computer infections but they are not harmless. If you have it on your system, the hijacker will change your browser’s settings and set its domain as your homepage and new tabs. Browser hijackers aim to redirect you to sponsored sites so that they could generate income so you’ll end up on all kinds of weird pages. We should warn you that not all of them will ba safe. Some could lead you to malware-ridden sites and you could end up with some kind of virus on your system. And even if it was harmless, you should not allow a program that entered your computer without permission to remain. It was attached to freeware as an extra offer and you did not notice, which allowed it to install. 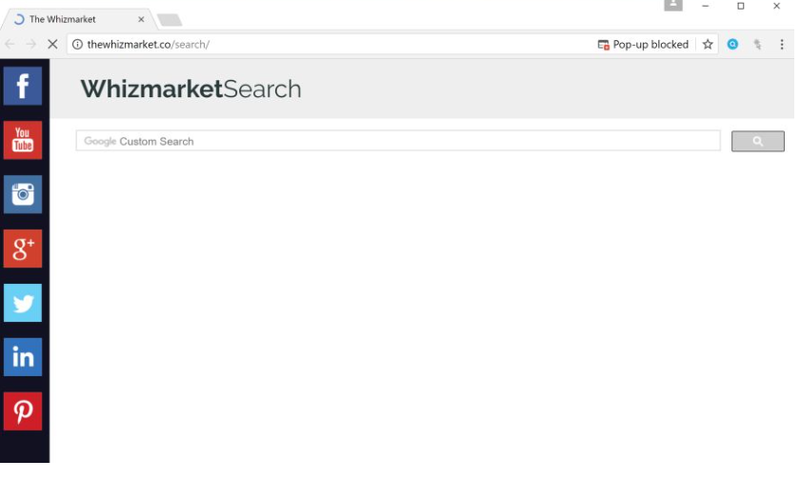 Remove Whizmarket Search. One of the main reasons why you ought to uninstall Whizmarket Search is the fact that it changes your browser’s settings without permission. It will set thewhizmarket.co/search as your homepage, new tabs and search engine and you will be stuck with it until you get rid of the hijacker. Your new homepage looks relatively okay, though it’s very different from the common search engine sites so you will notice the infection right away. There will be links to popular sites provided on the left side, and a search bar. If you were to perform a search, you will be shown weird results that may contain sponsored content. Since hijackers aim to redirect you to those sponsored sites, you may see a lot of those results. Clicking on them is not recommended because you could end up on all kinds weird sites where malware could be lurking. If you wish to avoid a possible infection, make sure you remove Whizmarket Search. You got infected when you were installing freeware. The hijacker was attached to free software as an extra offer and you did not notice it. If you used Default settings to install freeware, the extra offers were hidden and if you do not deselect them, they are allowed to install. In order to be able to prevent these unwanted installations, choose Advanced or Custom settings. You will be able to see and deselect everything that has been attached to the freeware. If you do this, you will not have to later delete Whizmarket Search. There are two ways to uninstall Whizmarket Search. You could try manual Whizmarket Search removal but if you struggle to find the hijacker, employ anti-spyware software. The program should have no issues with locating and getting rid of the hijacker.